What Factors May Cause My Case To Go To Litigation? The most common factors causing cases to go to trial is communication failure. The lawyer and client fails to communicate as to what can realistically be achieved at trial. The client often gets information from people that are not lawyers and the information is often inaccurate. The lawyer and client are not on the same page about expectation and possible jury verdict. Another factor is the low paying insurance company. These are often cheap policies where the policy limit is low. The insurance companies realize that their maximum liability is the policy limit. They could care less if the jury verdict is more than the coverage. All they will pay out is the limit and leave the insured hanging in the balance for the difference. We believe these types of policies should be not allowed; however, as mentioned earlier the insurance companies and their lobbyists are a powerful and influential source of peddlers. I think this questions really calls for a beginning and ending prognostication. In most courts, it takes a year or more to fully get the case litigated. After the claims process breaks down, the lawyer files a petition/complaint with the court; the defendant is served with a summons, and must answer that summons within a prescribed period; paperwork goes back and forth and even deposition of witnesses/doctors, etc. The trial date comes and the case is presented. After the verdict, each side has an opportunity to appeal to a court of appeal which can take an additional six months or more. So, that’s why it’s best to have a full understanding of the process. How Does Going To Trial Affect The Cost Of The Personal Injury Process? Going to trial is costly. The attorney spends money for the costs involved but this money is recovered from the proceeds at trial. If the verdict is low, there is a likelihood that the client may owe more than received. This type of outcome is a deflating one that should have been avoided. How Long Till I Receive The Damages After A Settlement Is Achieved? Once the settlement is agreed upon, the insurance companies are quick in forwarding the check. Normally it will take about a week or two to fully complete the process. The best you is to be simply you. Follow the golden rule and things fall in order. Treat others, doctors, nurses, therapist, opposing attorneys, etc. as you would want them to treat you. Don’t be late for appointments and never give in to anger or deception. This is what the other side is looking to point out to the jury. The claim adjusters and defense attorneys are looking to see whether you’re someone that will be convincing and likeable to the jury. The best is being simply you! How Can I Assist My Attorney To Get The Best Possible Outcome In My Case? Honesty and truthfulness are the greatest weapons. Life is what it is. The jury is made up of people just like you. They need to hear the story of the “normal” you, and how the injury has taken that from you. People relate to people. Attorneys are no different. There are few higher honors than fighting a just cause. Make all your doctor’s appointment, respond to request by the attorney, and follow the instructions. How Long Do Personal Injury Cases Typically Take On Average To Be Resolved? Most cases are resolved within 3 to 6 months if not sooner and that includes going to see the doctor, having medical rehabilitation treatment; following the medical dictates of the doctor(s). Cases that take a long time to be resolved are relatively more serious. Birth and death injuries take a lot of time. Issues regarding the amount of damages will take a longer time. 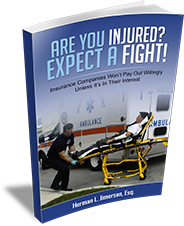 So most severe cases will take longer because insurance companies want to hold on to that money if possible to see whether or not you would want to ask for it all. A prepared attorney will know the value of his claim and will pursue every bit of it for his client’s best interest. 3 to 6 months is normally the life-span for a case to be resolved for less complicated cases. Every case is different. What Makes Your Firm Particularly Suited To Handling Personal Injury Cases? Experience matters. Experience you can trust matters even more. We have handled volumes of personal injury cases over the years. The important thing that makes us suited to be your attorney is that you matter as well. You’re not just a number or a billboard calculation once we’re completed your case. You become a part of the endless family of friends that understand what real service feels like. You tell your friends and loved ones about that experience and get them that same help when they need it. That’s our reward! Through you, we are powerful! For more information on Factors Leading To Litigation, a free initial consultation is your next best step. Get the information and legal answers you are seeking by calling (314) 786-3536 today. Should Someone Pay Their Medical Bills As They Come In? Can I Even Afford An Experienced Attorney? Home > Personal Injury > What Factors May Cause My Case To Go To Litigation?